Eating, napping, saving the day, eating, napping, etc. Smile and giggle. Indeed I maraud at times but what cute koala ninja wouldn't? Mostly I work subversively and undercoverly to cause a disruption to our systems. Someone needs to take down those central banks, power-hungry politicians and bureaucrats! P.S. Has anyone here seen the cutest baby koala at the SF Zoo lately? You really should! I know that I occasionally mention trees but really I *love* trees very much. Especially my "home tree." Koalas live in societies, just like people. Each Koala has their own territory, made up of a number of ‘home range trees’ and ‘food trees’. The Koala spends most of its’ life in the trees. For safety, it comes to the ground only to move from one tree to another. These trees provide the koala with food, shelter and places for social contact. Each koala’s home range overlaps with those of their neighbours. It is in the shared, overlapping trees that most of the social interaction takes place. These are very important trees. Thank you Home Tree for providing me with safety, shelter, food and social contact. As a Koala, I need to keep the pulse on what human think of us. 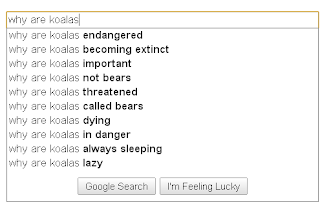 Luckily, Google allows us to see the most common search queries starting with "why are koalas..."
Five of the top 10 search results show a concern for our livelihood. How sweet. Remember to support your local koala today. Save Koalas! Wear cute t-shirts to spread awareness about our species. Modern koalas are known for their cuteness, nearly exclusive eucalyptus-leaf diet, and the unexpectedly weird noises they make. By studying the skulls of koala predecessors that lived five to 24 million years ago in the Miocene, an Australian team argues that evolution reshaped the animals faces to enable them to eat the tough leaves while maintaining their specialized communication anatomy. 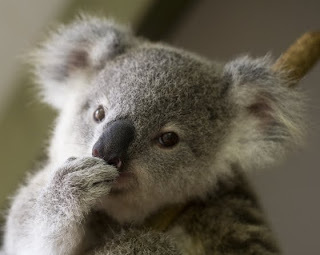 “The unique cranial configuration of the modern koala is therefore the result of accommodating their masticatory adaptations without compromising their auditory system,” write the researchers, led by Mike Archer, a paleontologist at the University of New South Wales, in a paper in the Journal of Vertebrate Paleontology. 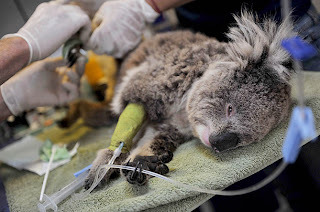 Remember to love your koalas properly, otherwise they may end up in the E.R. No, you're the cutest ever. Camus is boring. I find Karl Jaspers's philosophy much more enlightening. What would you say if you were a koala? Let a Thousand Nations Bloom -- Koala Cities?